The Bureau of Meteorology (BOM) released their 2017 climate summary this week, and as no surprise to many, we registered another record year of warmth - the third warmest on record and 0.95°C above the climate average. 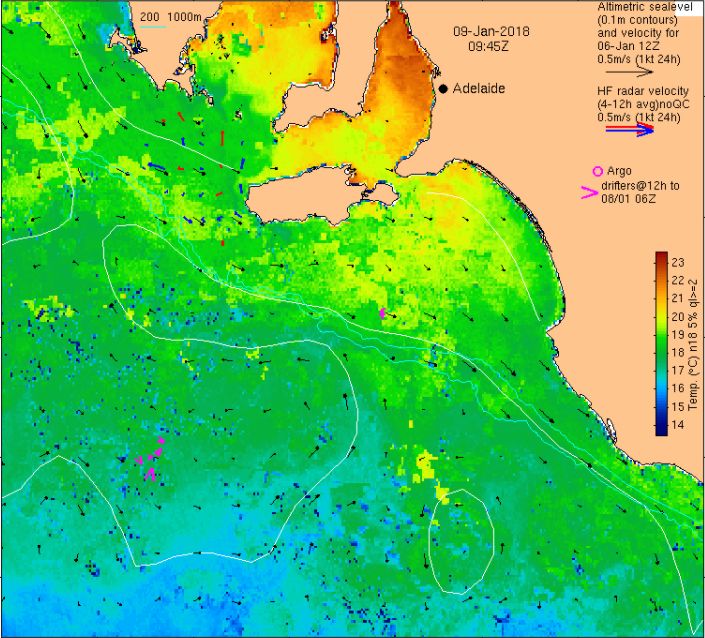 Looking at the waters surrounding Australia, and temperature anomalies (the difference between measured temperatures and the climate average) were 0.49°C above average, and the eighth warmest on record (dating back to 1900). For surfers, it's been easy to notice the warmer temperatures this year when excluding local upwelling events. And to highlight this point, some amazingly warm though somewhat uncomfortable sea surface temperatures were recorded off the Australian East Coast over the weekend. The cause of this burst of warm temperatures was the East Australian Current (which itself is currently 1.5-2°C above average) encroaching the coast. 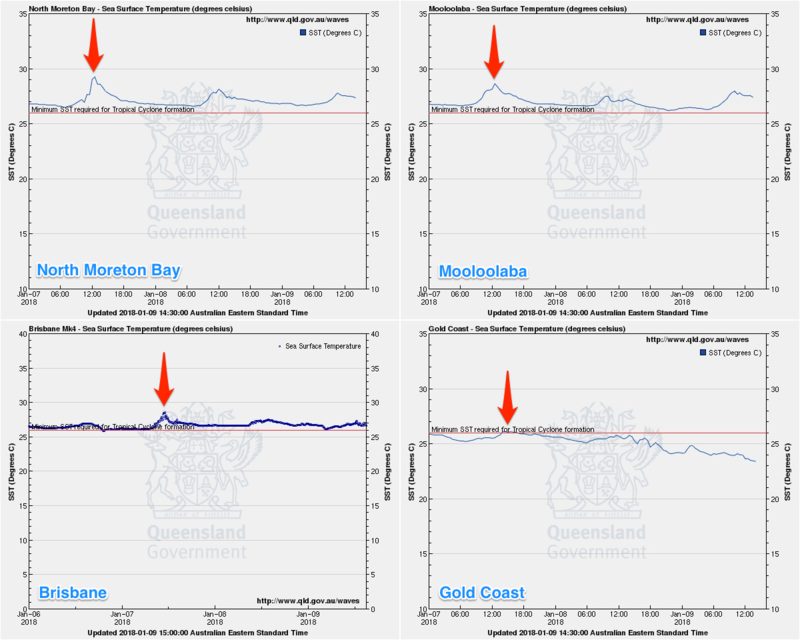 A network of wave buoys spread along the Queensland and New South Wales coasts recorded some incredible temperatures. Starting with the North Moreton Bay buoy, located off the southern Sunshine Coast, we saw sea surface temperatures reach 29°C on Saturday. This is somewhat equivalent with what you'd expect in Indonesia or the tropical South Pacific. It should be noted that the North Moreton Bay buoy is situated in a shallow semi-enclosed bay allowing it to heat quicker than the open ocean. Not far off this reading was Mooloolaba, a short distance north, which spiked above 28°C, while down on the Gold Coast temperatures hovered around 26°C. 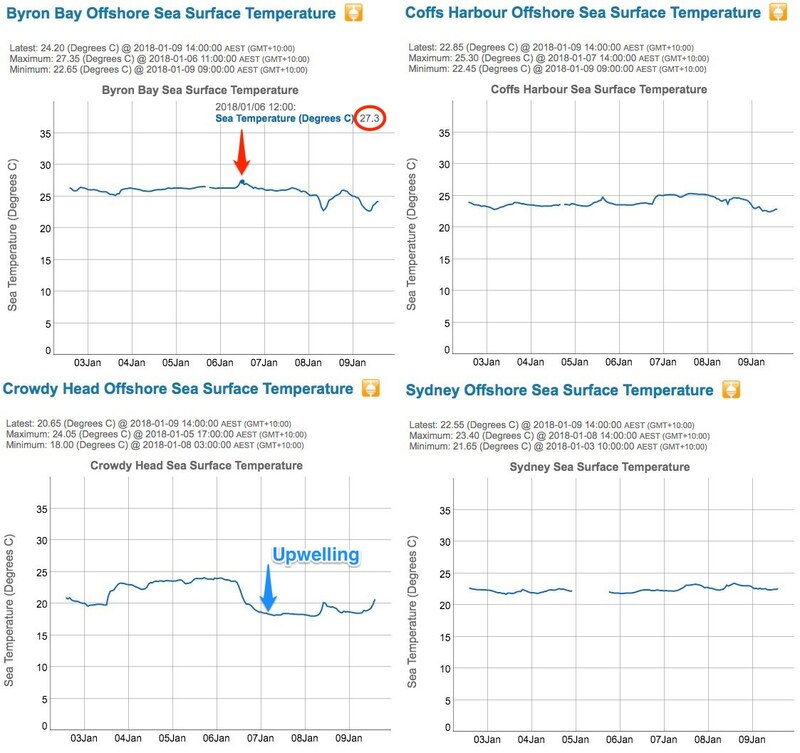 The Brisbane buoy off of North Stradbroke Island spiked above 27°C a day later on Sunday. Moving south and into New South Wales, the Byron Buoy jumped to 27.3°C on Saturday after being mostly steady at 26°C. Keeping in mind that the minimum required temperature for a cyclone to form is that 26.5°C. Coffs Harbour has been hovering between 24-25°C, while Crowdy Head, situated off the Mid North Coast shows the most interesting data. Temperatures were initially around 24°C, but a strong upwelling event was registered Saturday afternoon and Sunday under strong north-east breezes. A drop of 6°C was recorded in the space of an afternoon, down to a relatively chilly 18°C. Sydney didn't experience the same upwelling event, with temperatures hovering around a balmy 22°C, similar off Wollongong and in the deep south around Eden. 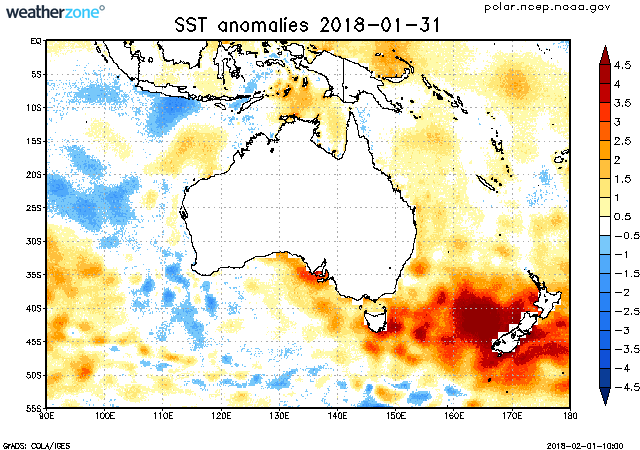 The BOM sea surface temperature charts shows that the Tasman Sea saw some of the highest temperatures ever recored last year and one look at the current anomalies shows a similar pattern early into this year. While this is great news for surfers who hate the thought of wearing rubber in the surf, the consequences to the marine environment and coastal eco systems surrounding Australia aren't as favourable. This was the first time we've see two consecutive years of coral bleaching on the Great Barrier Reef. Which species adapt and migrate with the continued warming of our oceans will be the big question over the coming years and decades. 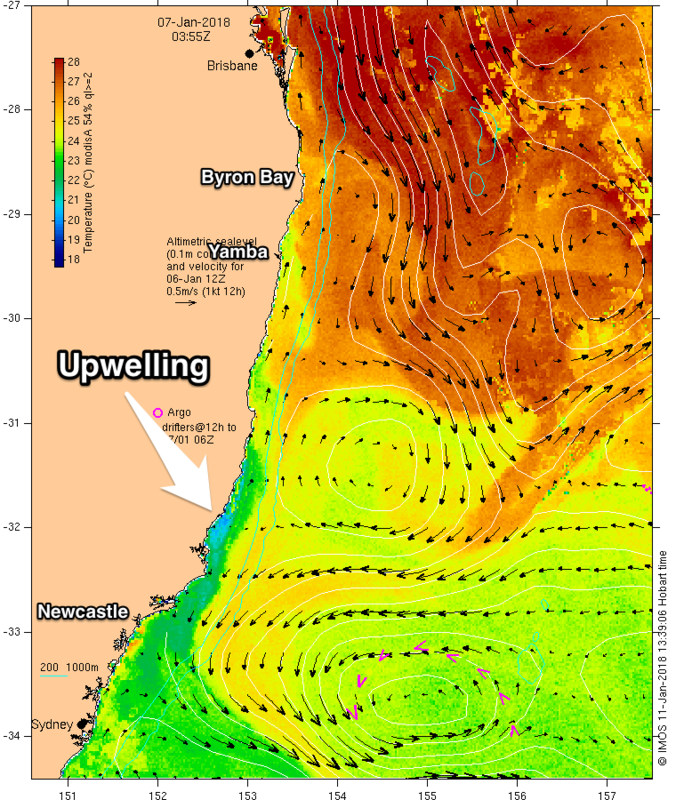 Satellite observations of the weekend's Mid North Coast upwelling event. All very interesting Craig. Any data on our friend the luminescent algae? An upwelling followed by warming would seem to be ideal. No sorry, but there is lots of it in the Hawkesbury River.. I remember the last time it occurred was after no rain for a long period followed by a torrential down pour and influx of fertiliser into the system? Wish I knew how to forecast it as it's one of the most amazing things to witness. The scientific data/proof why its a really bad idea to farm Atlantic salmon off King Island. we've had two mild outbreaks of red algae bloom this summer .....trichodesmium sp a cyanobacteria. And all that warm water pooling in the southern Tasman and out to NZ is completely fcuking the SE tradewind flow, again. Its shaping up to be one hell of a late Summer / Autumn for Tassie , NSW , SE Qld and NZ . I could surf in boardies in Vic at the moment within reason. Its feels warmer than usual but it still only calling 19 degrees. Whats North Coast at around August? 'Bout the same! Boardies all year north from Byron if you can handle the odd day of wind-chill (i.e. need a vest). True story Nick. Was on my way back to Sydney last week along the Great Ocean Road, stopped at Winki for a wave and almost suffered heat exhaustion in a 3/2 steamer. Couldn't believe how warm it was. Boardies and a vest would have been ideal. Hi mate I grew up surfing down around winki and Bells and through the 80s and 90s you could get away with a spring suit in the summer sumer times. I moved up north for a decade so was used to warmer water when I went back to bells last February. I surfed in board shorts a couple of times for 3hrs no way have I ever been able to to that there before. 30mins back in the old days and even on a 40deg day you would have been blue. South Coast waters around Middleton to Goolwa also feel warmer than usual. Which is OK for my old arthritic body haha. Indeed, looks around 21 degrees or so. Even warmer through the northern part of the gulf too. Yeah the temps I experienced off the South Coast over the Christmas period were the warmest I've felt back home at that time of year. The lack of persistent strong SE winds has helped a lot. Yes, there's definitely a lot of activity coming our way! Reposted as I realised WZ non-members couldn't see the image. The water temperatures around Sydney the last few weeks have been bath like. I'm on the skinny side and only wear boardies when it's really warm and no wind, but have been fine the last three weeks. Checking the Sydney buoy today and the readings off Long Reef have reached 24.35deg! Insane. Different story in WA, air temps 5-6 deg below average, water temps are normal if not a bit cooler than a usual summer if there is such a thing any more. Very very interesting thank you . Good one Craig and swellnet .